It’s that time of the year again–MARCH MADNESS. 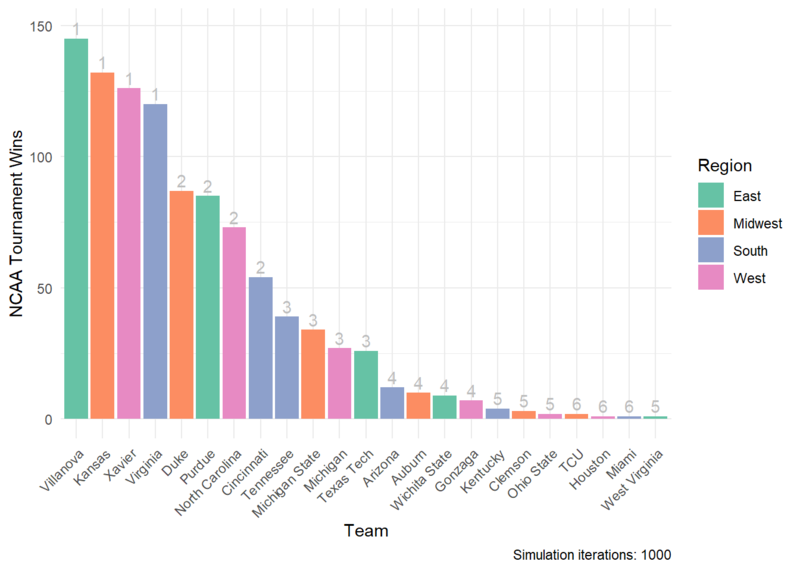 A few of us graduate students decided it would be fun to simulate this year’s NCAA Men’s National Championship tournament using R. When we all met to discuss our method to simuluate tournament performance, we quickly realized that each of us had a different method in mind. These methods differed in not only how we determined probability of win via seed, but also the techniques and packages implemented within R. Below showcases 3 different methods we used, each with different results. The methods are arranged in order of increasing use of historical data. Then, randomly sample from each team’s range and assign the win to the higher number (for each match-up). This is a crude method that will roughly correspond to seed. In other words, each seed has a higher probability of winning over each subsequent seed; however, it is theoretically possible, although very unlikely, for a 16th seed to win the tournament. A simulation given purely historical data would not be able to account for this because a 16th seed has never made it past the first round prior to the 2018 tournament. Below is the code I used to run the simulation. I tried to avoid for loops as much as possible and learn the map() functions in the purrr package. The code is not as efficient as I would have liked it to be, but it gets the job done and allows for a variety of plots. This above visualization depicts the potential ranges from which each seed can draw an arbitrary number. This drawing occurs at the beginning of each simulation iteration and determines each team’s tournament fate. 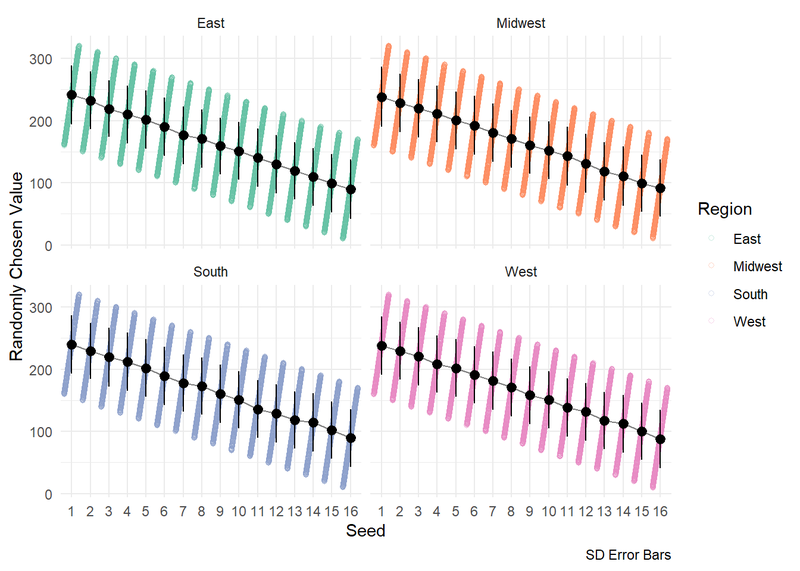 Higher seeds have an advantage of a higher possible range, but this overlap gradually decreases with increases in seed. 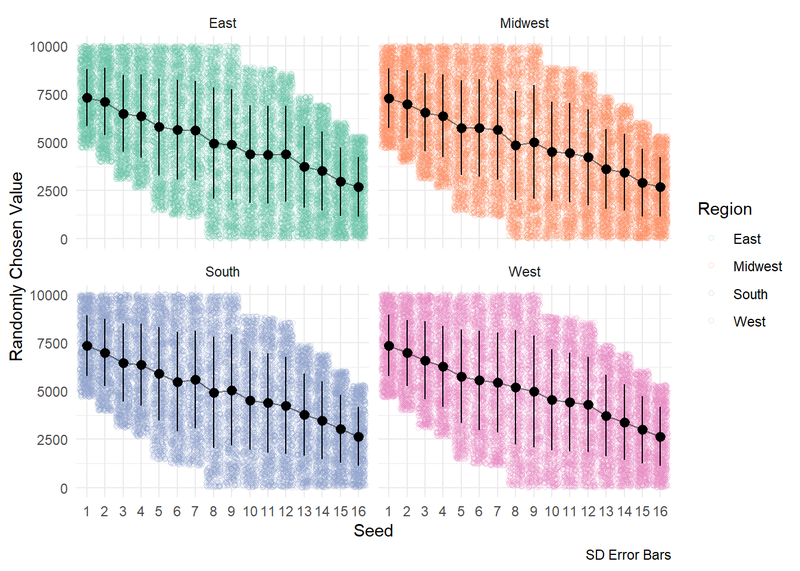 The above plot confirms this; higher seeds win more often than lower seeds for each round. 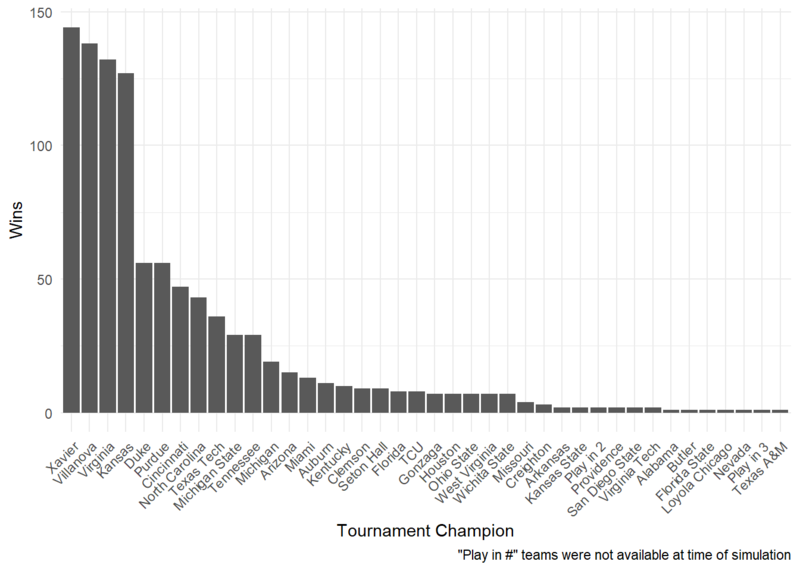 Now for fun, let’s see which teams won the tournament most often. There are some clear, but expected, patterns that emerge given a simulation based solely on seed. 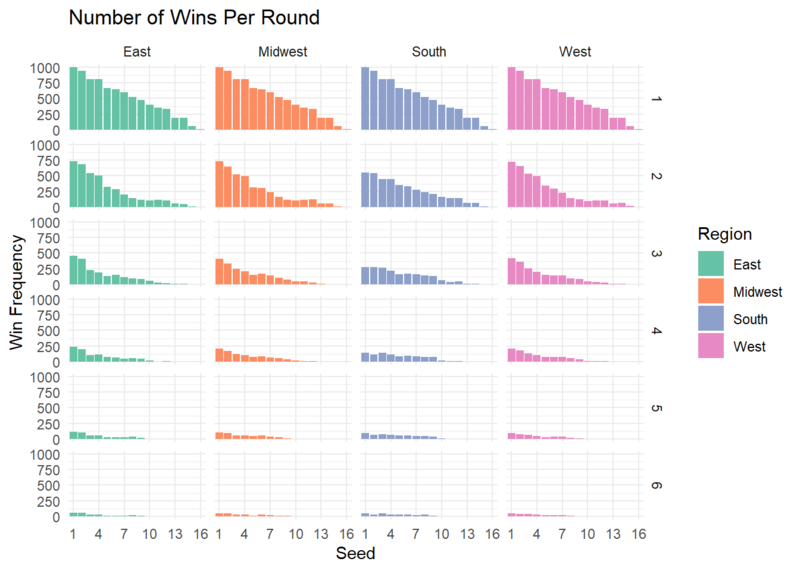 First, #1 seeds tend to win more often than lower seeds. Second, win frequency tracks well with seed, but in a diminishing step-wise way. The margin is closer between #3 vs #4 seeds, than #2 vs #3 seeds, than #1 vs #2. Perhaps this has to do with the NCAA men’s tournament not re-seeding teams on a round-by-round basis (see this video by Jon Bois). However, this method did allow for some upsets. As we can see, three #6 seeds won the tournament (TCU, Houston, Miami)! So, does this analysis inform my bracket this year at all? Sort of, but I’d rather just have R do it for me. Similar to Matt’s method, we also decided to go with a sliding range approach; however, we wanted to include historical win probabilities of first round play to determine the width of each team’s number range, as well as the overlap between seeds. We have the most historical data on the matchups in the first round because they happen four times each year. Therefore, it makes the most sense to use these data to predict each matchup, especially for future rounds where certain matchups are rare. 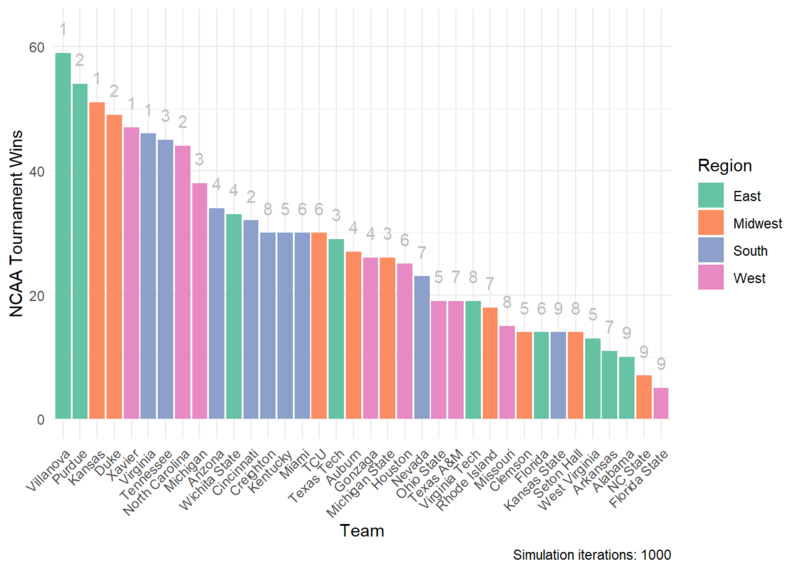 To do this, we created a range of values for each team in such a way that when one number is drawn from that range and compared against the number generated for its first round opponent, the odds of that team’s number being higher than the opponent’s match the historical probability of that team winning. In other words, every team has a range of values that can be chosen from, and this range overlaps with every other team by a very specific amount. If team 1 (favorite) has a range of possible values from 5-10, and team 2 (underdog) has a range of 1-6, randomly choosing a number for each team will result in team 1 winning almost every time. The odds of team 2 winning are equal to the odds of team 1 drawing a 5 and team 2 drawing a 6. This equates to a mathematical “and” problem that can be calculated by multiplying the odds of each event happening. Since each team has 6 numbers to draw from, the odds are 1/6 for each, or 1/36 (2.78%) for both happening at the same time. If we use these same dimensions, but want to increase the odds of the underdog winning, we could increase the amount of numbers that overlap by one number. Now the favorite chooses from 4-10 and the underdog chooses from 1-7. Here, the odds of the underdog winning increase to 12.24% because they can win if they draw a 5, 6, or 7 because it is possible for the favorite to draw a 4, 5, or 6. To make this method work for our purposes, we created an algorithm that defines a range of values for both teams in every first round matchup such that the odds of randomly selecting a value within these ranges matches the historical odds of that team winning. To do this, we determined the formula of the underdog winning (i.e., the number of outcomes in which the underdog would win, divided by the formula for the total number of possible outcomes). When this equation is rearranged to solve for n (i.e., the range of numbers that needed to overlap for a given probability), you get a quadatratic equation that can be plugged into the quadratic formula. Once n was determined, we needed to set the exact range for each team based on this overlap. To do this, we divided m by 2 and set half of n above and below this mid-point. Teams are assigned a value from this range in round 1, and then carry this value for each round to determine the winner of each matchup. Only in the event of a tie is a new number temporarily generated. And that’s it. Plug this into Matt’s code for each round. This above visualization depicts the potential ranges each seed can draw from using first round historical win probabilities. This drawing occurs at the beginning of each simulation iteration and determines each team’s tournament performance. Now let’s examine the results of the simulations. Higher seeds tend to win more often than lower seeds for each round. 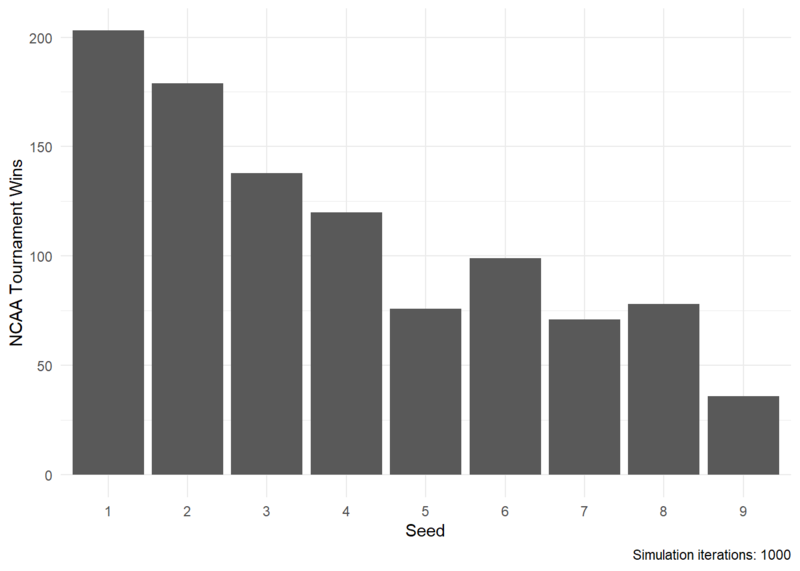 In contrast to Matt’s simulation, there is more variability towards seed #7 and this variability becomes more pronounced with each subsequent round. This simulation has Villanova (#1) with the most wins, while Purdue (#2) comes in second. According to this method, #5 and #7 seeds won the tournament fewer times than #6 and #8 seeds. Nevertheless, this method results in several upsets winning the tournament, even as high as #9 seeds. This section was added after observing the first round of the 2018 Men’s NCAA Tournament because, for the first time in history, a #16 seed beat a #1 seed. Therefore, we no longer had to guess this probability because it occured once out of 136 games–a probability of 0.0076. Higher seeds tend to win more often than lower seeds for each round. 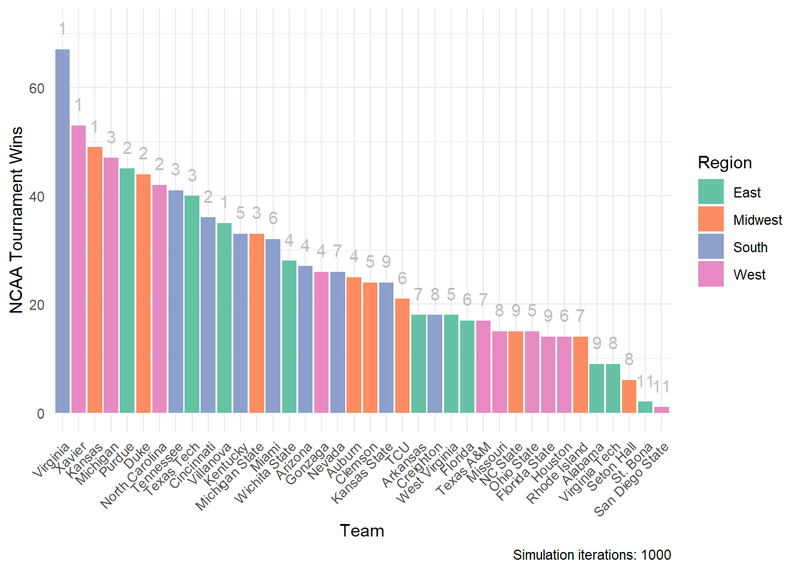 This simulation that incorporated the results from the first round of the 2018 men’s NCAA tournament had Virginia (#1) winning with Xavier (#1) coming in second in overall tournament wins across all 1000 simulations. According to this method, overall wins track well with increasing seed. Lower seeds win more than higher seeds. However, upsets are definitely allowed to occur with #11 seeds winning the tournament! This is most likely a consequence of this year’s (2018) tournament containing a variety of upsets, namely a 16th seed over a 1st seed victory. For my bracket, I wanted to match the probability of any given seed (seed X) beating any other given seed (seed Y) to the actual proportion of times that seed X has beaten seed Y in real life. For example, 15th seed teams have beaten 2nd seed teams 8 times in 132 games, or 6.1% of the time. Luckily for me, someone has already gone through every single game played and calculated the proportions for every match-up. So, with the help of my friend Giuseppe Miranda, I created a table containing all of these proportions where rows represent winners and columns represent losers. So, if you want the proportion of times that 1st seed teams have beaten 16th seed teams, look at [row 1, column 16] and you will see that 1st seed teams have beaten 16th seed teams 132 times in 132 games, or 100% of the time (132/132 = 1). Likewise, if you go to [row 8, column 9] you can see that 8th seed teams have beaten 9th seed teams 53.2% (or 0.532) of the time. Next, we will need a data frame for each round of the tournament, where each row represents each game played in the tournament. Each row will contain the name of the teams that are playing each other (‘Team1’ and ‘Team2’ columns) and the seed numbers of both of those teams (‘Team1Seed’ and ‘Team2Seed’). Later we will loop through these data frames to simulate each round of the tournament and predict the winner of each game. We are then going to loop through our dataset for round 1 and calculate a score for each game played by randomly selecting a decimal number between 0 and 1. After we assign our score we will then refer to the cell of our ProportionsData, where row = seed of team 1 and column = seed of team 2. This cell should give us the proportion (in decimal form) of times that a team with a seed number equal to the seed of team 1 beat a team with a seed number equal to the seed of team 2. If our score variable is less than or equal to the proportion in this cell then team 1 wins, if not then team 2 wins. In other words, the probability of team 1 beating team 2 should be equivalent to the proportion of times that team 1’s seed beat team 2’s seed in real life. #Select 1 random decimal between 0 and 1. #Compare our 'score' variable to the real-life proportion data. #beat the seeed of team 2 then team 1 wins. Otherwise, team 2 wins. Next, we will use the results from round 1 (we now have a winner column in our Round1Data filled in with the winner of each game) to fill in our data frame for round 2. # (i.e. higher seed number). And finally, we’re simply going to repeat those last two steps for every remaining round in the tournament. The above steps were repeated 1000 times to simulate performance. And it looks like this simulation predicted Xavier to win most often! 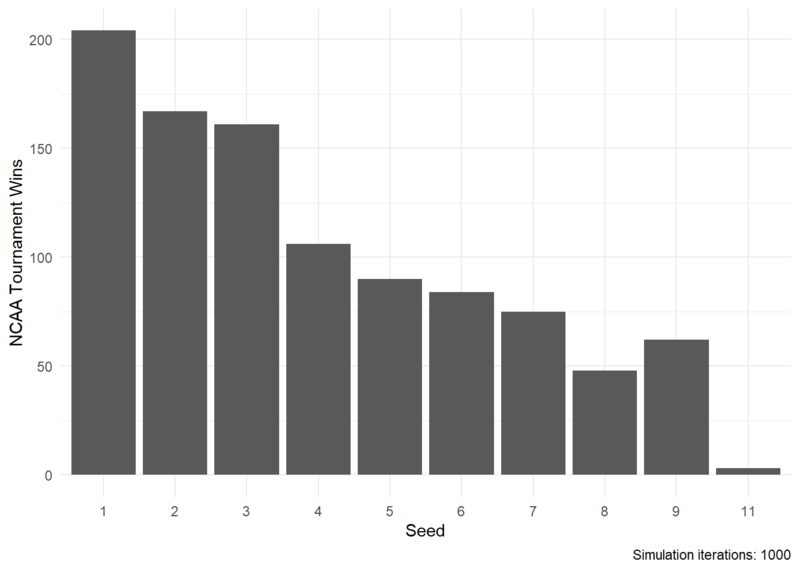 Of course, much more goes into tournament performance than seed placement and historical win probabilities. At the time that we first wrote this, a #16 seed had never beaten a #1 seed in the first round. Models using purely historical data (such as Nick’s) were unable to account for #16 seed UMBC’s historical first round victory over #1 seed Virginia in this year’s NCAA Men’s tournament. Nevertheless, this was a super fun exercise in R and thinking about modeling tournament style performance. Hope you enjoyed this post and any feedback is always welcome! A huge thanks to my friends Nick Ray, David Hoagey, Linh Lazarus, Giuseppe Miranda, and Ekarin Pongpipat for their enthusiasm and help with this blog post. They helped turn a small idea into an awesome collaboration where we got to share thoughts, work off each other’s ideas, and learn more about R!